What's your prediction for the outcome of today's Florida Republican primary? Time Magazine says Newt Gingrich is bracing for a loss and in the process of reinventing himself as a grass-roots insurgent. It says Newt is floundering because he was outstumped and outspent. Newt Gingrich has taken $10 million (so far) from a PAC funded by Las Vegas billionaire Sheldon Adelman and his wife. What's Newt doing with the money? He's bought $6 million of ad time in Florida. "Gov. Romney will have vastly more money than I will," Gingrich said, but suggested he has more grassroots support. "People power beats money power every time." Adelson owns, among other things, the Venetian Hotel in Las Vegas. I'm crossing that one off my list of places to stay. The New York Times has an article about Newt Gingrich's leadership style that voters may find very troubling in choosing a leader for the country: He doesn't take advice from others about strategy decisions -- he just marches to his own drum. Instead, Mr. Gingrich makes nearly all the key strategic decisions by himself, and in a manner befitting his personality — spontaneously, thinking aloud, often voicing a half-formed idea in full public view before committing to it. "I think the destructive, vicious, negative nature of much of the news media makes it harder to govern this country, harder to attract decent people to run of for public office and I am appalled that you would begin a presidential debate on a topic like that," Gingrich said. "Every person in here knows personal pain. Every person in here has had someone close to them go through painful things. To take an ex-wife, and make it two days before the primary a sign question in a presidential campaign, is as close to despicable as anything I can imagine," Gingrich said. How clever (not.) A family values spokesman who asks his wife for an open marriage and carries on a 6 year extra-marital affair is now a victim of "personal pain." I wonder if his daughter, the one who's an expert at messaging and branding, came up with that. 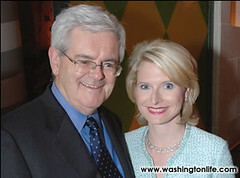 Marianne Gingrich, the second of Newt Gingrich's three wives, is ready to unload. ABC News has the interview, which as of now, it plans to air on Nightline Thursday night. Excerpts should be available during the day. They aired a short clip Weds. night with the teaser that she says "there are things voters need to know." The only direct quote is of her saying that Newt looked directly at her and told her "Calista doesn't care what I do." The interviewer asks her what that means, and then cuts out before her answer. Guess we'll find out tomorrow. Speaker Newt Gingrich said on Friday that he would ask Congress to enact legislation imposing the death penalty on drug smugglers, and he suggested that mass executions of people convicted under such a law might prove an effective deterrent. ..."The first time we execute 27 or 30 or 35 people at one time, and they go around Colombia and France and Thailand and Mexico, and they say, 'Hi, would you like to carry some drugs into the U.S.?' the price of carrying drugs will have gone up dramatically." the former Georgia lawmaker racked up massive travel bills but money had only trickled in since he got into the race earlier this spring. Gingrich could use his own money to keep going. He is brushing off the departures as "gossip," saying "No one has a clue why they left." I don't think the "why" matters, given the number of quitters. When 18 people leave a campaign, it's fairly obvious there's something very wrong. Time to fold Newt. No one's paying attention to your campaign because you are old news with no recent accomplishments and a past record of taking the worst positions on policy. Do we even need to mention his personal life? 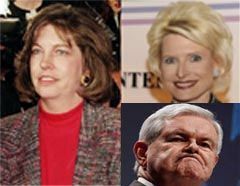 Marianne Gingrich, the second ex-wife of Newt Gingrich, has broken her 12 year silence on Newt, in a lengthy interview with Esquire. She characterizes him as a fraud, and not just for his "kick 'em when they're down" dealings with the women in his life, which we all knew about years ago. My biggest gripe with Newt is still with is 1994 Contract on America. I still think there's no way he would gamble on his history and run for President. He's probably angling for some other job he can get by appointment. C-SPAN: "If you were to run, what factors would you take into account? What would lead you to think about running?" Blast from the past: Is Newt Gingrich About to Gamble on His History? Is Newt Gingrich About to Gamble on His History? Christy at Firedoglake writes about Newt Gingrich's lastest announcement that if he can raise $30 million in the next three weeks, he'll hop in the presidential race seeking the Republican nomination. In 1981, Newt dumped his first wife, Jackie Battley, for Marianne, wife number 2, while Jackie was in the hospital undergoing cancer treatment. Marianne and Newt divorced in December, 1999 after Marianne found out about Newt's long-running affair with Callista Bisek, his one-time congressional aide. Gingrich asked Marianne for the divorce by phoning her on Mother's Day, 1999. [Source: New York Post, July 18, 2000, Newt's Ex Wife Aiming to Pen Book by Bill Sanderson, available on lexis]. Some people I know say that if Rudy Giuliani self-destructs or bows out as a GOP presidential candidate, Newt Gingrich will step in. He has said he's open to stepping at some later point in the cycle. Former House Speaker Newt Gingrich equated bilingual education Saturday with "the language of living in a ghetto" and mocked requirements that ballots be printed in multiple languages. "The government should quit mandating that various documents be printed in any one of 700 languages depending on who randomly shows up" to vote, said Gingrich, who is considering seeking the Republican presidential nomination in 2008. He made the comments in a speech to the National Federation of Republican Women. "The American people believe English should be the official language of the government. ... We should replace bilingual education with immersion in English so people learn the common language of the country and they learn the language of prosperity, not the language of living in a ghetto," Gingrich said to cheers from the crowd of more than 100. He sounds like Tom Tancredo. Now, that's an idea for a frightening ticket combination. How does he differentiate himself from Clinton? He says he didn't commit perjury.